The new logotype looks great. The capitalization is a non-issue in the long term, it doesn't matter if people continue calling it lowercase git. I have qualms about the Octocat mark though. Everyone wants to be Apple and drop their name in favor of a recognizable logo. What people forget is that the logo for Apple is actually an apple. That's what made it so easy for Apple to adopt this strategy early on. The same approach can work for companies that have a massively recognizable brand and an advertising budget dedicated to burning the icon into our retinas (Nike). But it still requires having a memorable mark. For applications of the logo where scale comes into play, GitHub's designers clearly haven't reviewed their branding 101 coursework. Read Paul Rand's IBM style guide for a refresher on the 8-stripe and 13-stripe versions of his logo. The applications they show on their site at 30x30px and lower are barely readable. The original Apple logo was doubly clever, as it referred to both of Newton's important contributions to physics (gravity and prismatic separation of light). Funny. I never thought about it and just assumed it was a hidden wink to Adam and Eve eating an apple from the tree of knowledge. There is also a story saying that it was a reference to Alan Turing, who committed suicide by eating a poisoned apple following a forced hormonal treatment after being convicted of the "crime" of homosexuality. But it turns out to be only a coincidence. When the Octocat Mark is rendered at any size less than 75x75 pixels, it's pretty much impossible to tell that the "tail" of the cat is actually a tentacle. That's unfortunate, because on https://github.com/logos the only recommended use for the mark is in social buttons, which are going to be relatively small. Even at larger sizes, the tentacle just seems tacked on. Maybe that's OK: we know it's a tentacle, others can just blissfully think it's a tail. See the home button in the upper left corner of the page. You don't see the suckers but it is recognizable. I don't think they're terribly worried about seeing those details. Agree. They should have a guideline about using the cat at small sizes, or provide customized low-rez versions. I looked at it and thought it might have worked better if they ditched the suckers and just used multiple waving tentacles. If you download the mark, it's a .zip including some smaller versions without suckers on the tentacle. Exactly. Compare the logo in the blog post to the one in the masthead. And then go one step further and compare to the favicon (no tail there). The small sizes don't have to convey that the tail is a tentacle, they just have to convey "GitHub". Only at larger sizes. At the 16x16px version, there isn't anymore. The homepage now looks very bland. Perhaps to people who really know typography the GitHub name is very distinct, but to me it doesn't distinguish itself and reminds me of a bootstrap site with a couple hours of tweaking more than a unique and memorable brand / style. Yeah, I'd agree. The original, full-color logo gave the site a personalized touch. Given the old icon was just a lowercase g in various containers, I think this is a good step. The octocat is already recognizable, and although it's a little too detailed for small rendering, it's still relatively unique and distinct. Nice work on this one. It may not be the perfect symbol, but it is uniquely and definitively github. How old are we talking about? As far as I know, their logo has been the same, only inverted , for the last year or so. While I love GitHub, and I use it on a daily basis... I'm really confused how news like this gets to the very top, but other submissions (many highly technical) sometimes barely get 5 votes. I'll get off my soapbox now. Does anyone else notice the striking similarity between the new Enterprise design and Bootstrap? I guess that's what you get when you hire Mark Otto. They built the page with Bootstrap. Almost all the CSS classes are provided by it. What's wrong with that? Nothing considering how many "start ups" do the exact same thing. At least github enterprise changed some stuff. I wasn't suggesting anything's wrong with it. Certainly the creator of Bootstrap has liberty to copy himself. I guess I'm just a little surprised he didn't want to showcase his variety. Meh, I'm usually not one for variety :). The purple space background was designed by an illustrator here at GitHub and I just put it to use. That the page ended up being purple and blue like Bootstrap is kind of just a coincidence. Previously the Enterprise site's background was a custom-made OS X ish space background—lots of blue and gold. Beyond that I don't see a huge concern of the two looking similar. Bootstrap 3's homepage will be massively different from v2s today if it helps though. Do they have something against the Octodex? "Q: Can I submit an octocat to the Octodex? We make quite a few octocats here at GitHub. Since they probably wouldn't be seen by more than a few people internally, we created the Octodex as a way to show them to the world. Everything on this list is official GitHub artwork and is under GitHub's trademark license, so we only include submissions from people affiliated with GitHub." And their quality is indeed very high. "Q: Can I make my own octocat? So long as it is created for personal/fan use, you are more than welcome to create and display your own octocat. If you choose to distribute your octocat, you may not do so with a license, Creative Commons or otherwise, that allows modification or distribution of the octocat." I can see why they changed it. Their old one wasn’t a logo (type excluded), it was an illustration. Riiight, now I remember. That lowercase g was always a little funny. It probably feels to them like GitHub is so well known that the company needs to be called that. I think they're actually early enough on that they could just make it one of their products. Well, it's pretty common to have a generic name for your corporation. No one but their lawyers ever really knew about that name. I'm saying that I think they could actually build a corporate brand separate from GitHub. It seems that GitHub wants a more "serious" look. I wonder why that is. Do managers dismiss GitHub for Enterprise as a possibility because it feels hackish/unprofessional? I think it's not that they want to be more "serious" but more they didn't want the logotype to look like the first idea a college kid had. The type was so terrible on it. I think it just looks more modern, and less '2007'. It’s hard to tell whether this creature has arms or tentacles, or both. Octopuses have both. Also, 7-arm octopuses are still called ‘octopuses’. I'd really like to hear their thoughts around the capitalization of GitHub. Everyone who uses git interacts it with it in downcase. To see it upcased like that is unfamiliar. I think the difference is the command vs the product. Even the git homepage refers to it in uppercase almost everywhere . A similar example would be capitalizing Java everywhere, but using java for commands. "Git" is the system of software, protocols, metaphors, and storage. "git" is the executable. I much prefer lowercase as well. I wonder if a not-insignificant proportion of their target market was pronouncing it as "jih thub". maybe because the small g is similar to google's. I'm a little surprised by the striking similarities between Octocat and the "Octonauts" (www.octonauts.com) - a cartoon in the UK that my two kids are mad about. I'm trusting that these copyright/design right concerns have been contemplated at least - not least because of the similarity in name as well as in design. The Wikipedia page also notes that the Octonauts are based on books published in 2006, 2 years before the founding of Github. While I am not a lawyer, I do not think there is very much similarity between the two. 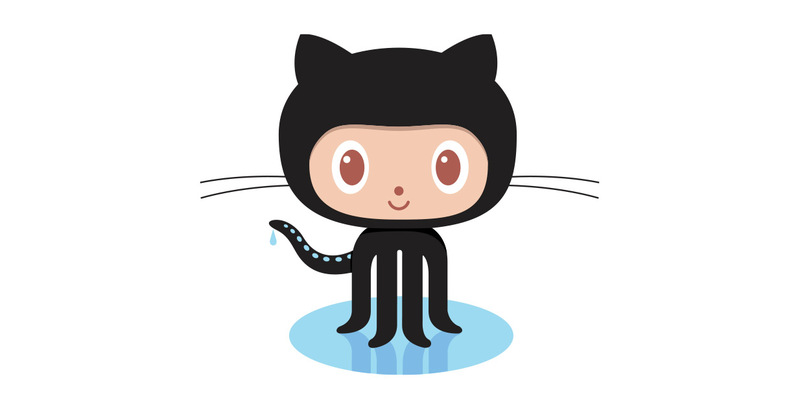 Github's Octocat is half-octopus, half-cat. The Octonauts are 8 nautical animals (including an octopus and a cat). All very wise observations, folks. I feel better now. And thanks. Is it just me, or is the logotype very similar to Atlassian's? I like it a lot. Quick, find a way to make this about you. Does this mean I have to get a new shirt? What's the story behind Octocat? That...thing...doesn't really do much for me as far as a corporate logo goes. Rather complex shape (see references to scaling problems), sorta catish but not, WTH is that weird tail (cat, four legs and a...), this post is the first reference to "octo" I've seen in the months I've used the service, there's 5 limbs not 8, etc. Makes me think of a little kid in a Halloween costume. I've always figured it fits because: 1) The internet likes cats. 2) Git can do octopus merges I guess? Ah, thanks for that - I didn't realise they were stock images. http://www.idokungfoo.com/ is the original illustrator, he sells artwork on istockphoto.com. It was a stock image that started on the 404 page. People loved it, so the octocat started showing up in more and more places and then grew to become the logo. Git isn't a spoof of get, Linus named it because he's a git. Or at least that's what he said once. "git" can mean anything, depending on your mood. mispronunciation of "get" may or may not be relevant. works for you. Angels sing, and a light suddenly fills the room. And that's why git's awesome. Well, Linus is. But by extension that makes git awesome so you are technically correct (the best kind). It’s probably a tweaked version of Secca Extra Bold or Botanika Bold. So it is! I see that it was tweaked quite heavily; rounded corners on all the glyphs, altered ‘G’, ‘i’, and ‘t’, different weight, etc. Were you involved in the design process? How was Apex selected? It’s not a particularly well-known font and it’s for sale at very few places. Nah, I'm just repeating what @bryanveloso said: https://twitter.com/bryanveloso/status/324204710888357888 and https://twitter.com/bryanveloso/status/324214383989383168. Does this mean my GitHub hoodie is a collectors item because it has Octocat v 1? Should I stop wearing it? Anyone have before and after shots? Pretty subtle logo change really. I think it's a solid step forward. It's a more serious typeface for a more serious company. The b in the logo feels a bit strange to me.. anyone else get a comic sans feel with it? Anyone know the reason for the drip of water that the Octocat is holding? Every little droplet of code helps. Or something like that. I may be reading too much between the lines, but thy post, and the logo-page, are corporate, goal driven projects (maybe top down) that are then wrapped up in nice fluffy words. Its not the same as nice fluffy ideas, getting thrown out and tested, with maybe as much attention from lawyers as aspell. Of course it happens, but this is the time github went from that nice sparky startup, to the long slide into corporate beige. In many ways its a triumph, startups just don't succeed like this. And I would wish success and money and more success on them all - but my antennae twitched. The negativity and bitterness (even when wrapped in the veil of a nice comment) on HN continues. The only difference between a sell-out and a not-sell-out is the presence of a buyer. That's it. How you treat your customers and your employees, the work you put into your products, and the service and loyalty that you engender in continued business is all that matters. GitHub does all those things extraordinarily well, and more. Changing a typography and logo a tiny bit signifies nothing more than they wanted to change their brand's typography and logo a tiny bit. Providing the usage scenarios for their marks is not needed at worst, and really useful at best. Come on, they are at an inflection point that has ruined many many other companies before - and I want this one to succeed. Bitter because I did not do it back in 2006? Nah- the litany of "if only" is boring even if I am the one saying it. Uh, what? Github is still run by its founding team. They're big because they sell something that is extremely awesome compared to the market substitutes. The good guys don't always win, but they did this time. Spare us the anti-corp agita. They are stretching past the ability of a founding team to be intimate with everything - which in many many ways is fantastic - top 1% of startups only. But I read an outsourced rebranding that came in nicely wrapped up, even with legalese in appendix A. And then octo-goodness sprinkled on top. This does not feel like a move and an announcement with GitHub DNA at is heart. It feels added on. Done well, but my antennae twitched. The move from scrappy startup to 100m in funding is fantastic - real poster-boy stuff. But losing your identity in that move, what makes that team great, is so common it should have a name. I want Preston-Warner et al to succeed. I want them to leap the chasm into a functioning corporate body that does whatever they have planned. But this one feels like the huge difficulties in running a fast growing high profile company might just be stretching them. I don't know - all I have are inferences and hunches. Maybe they have time each day to think and ruminate on what GitHub needs to become, have time for creativity. Or maybe they run from one to another meeting exhausted at days end. Who knows. Anti-corp agita? I used to take over the college buildings in student protests, then sit up all night arguing market driven solutions beat socialism everytime. "But I read an outsourced rebranding that came in nicely wrapped up, even with legalese in appendix A." I can assure you, your read is wrong. This work was done by GitHubbers collaboratively and painstakingly. Good luck with the rebrand and the (I suspect) avalanche of new stuff to be doing. Who cares. Lone founders are apt to redesign logos too. The fluffy language was probably added because a simple, "here's our new logo cause it's better" is probably a little too brief, especially for companies who may have incorporated those marks into their own assets, and need a little justification for re-work. But that's it. Back in the day, it would have been "here it is because it is better". It worked. Be careful changing a winning formula. And yes that's rose tinted glasses perhaps. They should add whiskers to the new logo. If imitation is the sincerest form of flattery, Drew Houston ought to be feeling great right about now. Can you explain on why you think the new Github homepage imitates Dropbox's homepage? They both look pretty standard to me. lol?? Are you being serious? Besides the fact they both have a signup form on the right the websites look nothing alike. Looks pretty twitter bootstrap like, if you ask me. I feel that a lot of designs are ending up like this due to bootstrap influence, which, might be influenced by dropbox for all I know. I wrote all the styles for Bootstrap and refactored GitHub's forms and buttons a few months ago for a similar approach. Not 100% the same, but definitely close. All those styles are tested thoroughly within Bootstrap and made it super easy to update and standardize our styles, while at the same time dropping mad duplicate code. The overall homepage though I think looks nothing like Bootstrap's docs, if that's what you're implying. Also, Bootstrap, and GitHub, was not influenced by Dropbox. We just iterated on that stuff internally in a pull request and shipped when we were happy with it. I wasn't implying that it looks like Bootstrap's docs, I was saying that it looks influenced by the conventions Bootstrap conforms to, which, makes sense from your first paragraph. Either way, I don't think it matters. It looks good and clean. Slipped my mind that you went to Github. Definitely looks a lot like Bootstrap as well. Though if it wasn't inspired by Dropbox, there are nevertheless some strong similarities. Namely the signup form, footer and the call to action for the paid product. I can see developers not understanding what I mean, but surely a designer must! Not trying to be critical by the way. I'm a huge fan of every company/framework/person etc mentioned here. I'm just really interested in the form, function and messaging of homepages.